This photo was taken in the last week in February 2012 at about 9 am. The location was in Washington DC right near the Capitol building. The "Take It!" 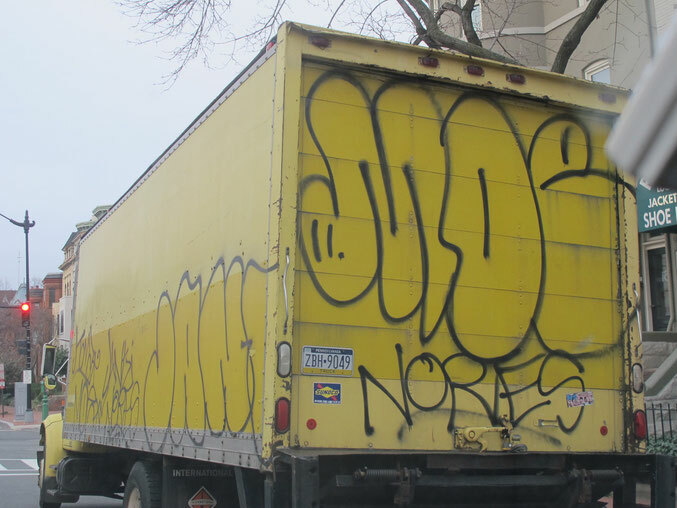 came from my being caught up in how little of this spray can paint is on trucks in this area. We are very fortunate that there seems to be a vigilance that dissuades this type of harm being done. I know in other cities there is a lot more of this sort of thing done. It just seemed to be so out of place being near the capital building that I was more shocked than anything else. I must also let you know that the vigilance by the police is very rigorous as they do not want any sort of Truck Bomb situation to happen as it unfortunately done elsewhere. So the very few trucks that are allowed near this ever so important building must have all sorts of permits that I have seen being checked at length. This truck was on the fringe of the area that is under such close surveillance. The After Take: The reason for graffiti has always been a mystery to me. Some see it as art others see it as plain old defacing and not to be tolerated. The answer seems to call for it to be covered up just as soon after it has gone up, to discourage the painter and hope they will not return to put up another installment. I find I almost need a printed guide to help me understand what has been put up lol. Thanks for joining us for the current photo presentation. You are cordially invited to return Friday, November 16th for a new picture that we hope you will enjoy. Wishing you a day without graffiti, wherever you might be. I'd be so pissed if that were my truck. Graffiti is so hard to read. If you give it an out of the box look it now resembles a cute bumble bee. At least it'd be easier to paint over than a bus with logo's all over it.